Books about cats are good. Books about pirates are good. 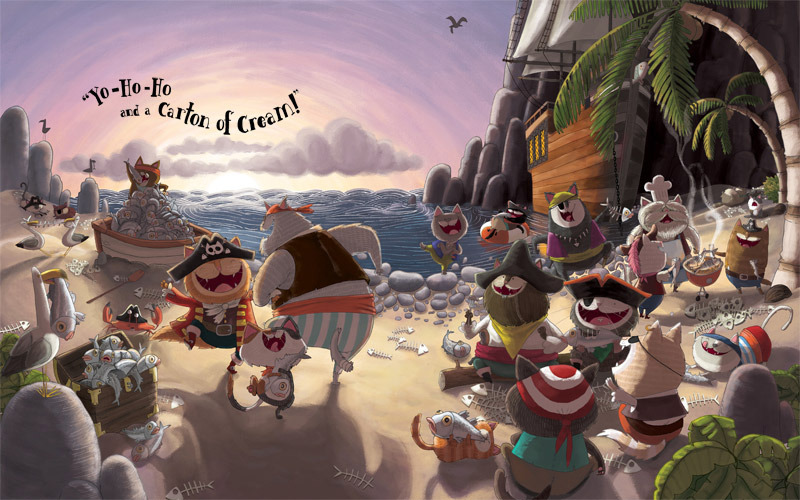 A book about cats being pirates – well, where can it go wrong? Alfonso the cat overhears some old fisherman talking about a huge haul of haddock due to pull into harbour at first light. He dashes off to round up an unlikely crew of moggies with the promise of all the fish they can eat. In the dead of night the cats cast off from the shore and The Kipper makes its way to the ocean. The skipper of the trawler, Trelawney P. Craddock, is smugly sailing home with his pile of fish when, out of the mist, a horrendous howling is heard and an apparently empty ship sails out of the haze. In a panic, the humans abandon their ship, to the delight of the piratical cats. The sea-mogs scoffed haddock and danced on the sand. This excellent book by Peter Bently won the Roald Dahl Funny Prize in 2011. It surfs along nicely in rollicking verse and with a delightfully anarchic sense of triumph when the cats get their prize. The vocabulary is slightly more sophisticated than your average picture book (probably on a par with the longer Julia Donaldson books) and so this should appeal to a fairly large age-range including the first couple of years of primary school. The illustrations, by Jim Field, are lively and full of character. What I particularly like is the fact that the story does not end with the cats purloining the fish but with their return home some weeks later, and with a clever (if probably not original) pun. This is a great book that both adults and children will enjoy reading.